On January 12, 2018, Advaita released a major update to its platform, with improvements to iPathwayGuide, iVariantGuide, and iBioguide. For a complete list of databases and versions, please see report information within each application. Improvements to account registration page to ensure proper organization affiliation. iPathwayGuide: Improvements to parsing of CuffDiff-formatted files to maintain association of phenotype labels. Fold changes and p-value parsing remains untouched. 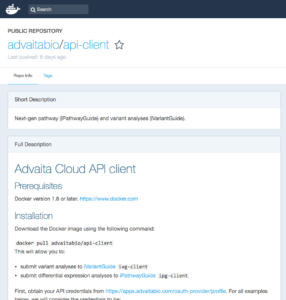 With Advaita’s latest update to its applications and knowledge base, Advaita updated its API for iVariantGuide and iPathwayGuide. An API or (Application Program Interface) is a set of routines, protocols, and tools for building software applications. An API specifies how software components should interact. Advaita’s API is designed for advanced users of iPathwayGuide and iVariantGuide who would like to streamline their data processing and bypass the UI for submitting data. 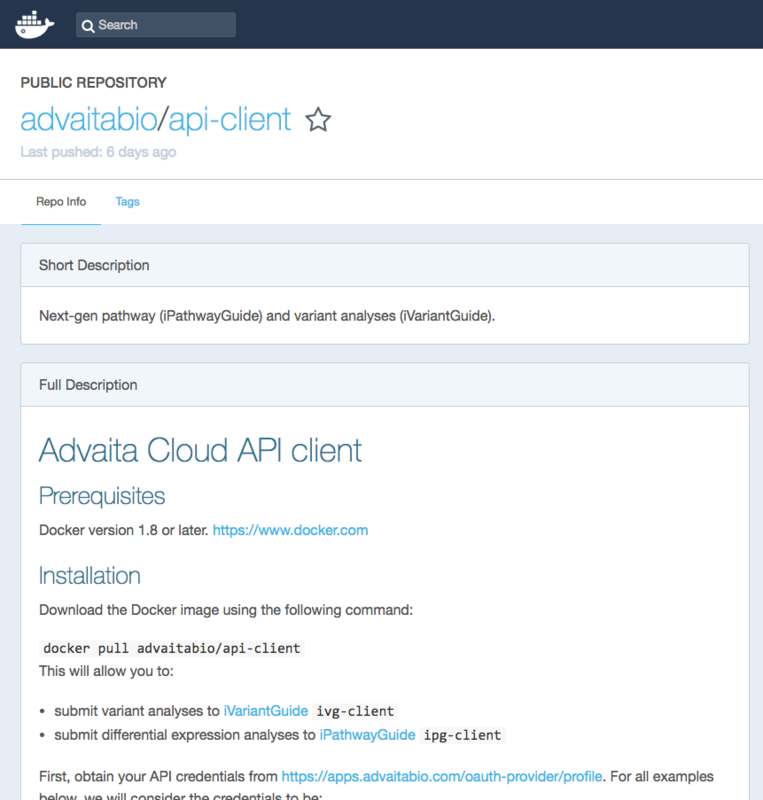 Advaita’s API is designed to take advantage of the AWS EC2 environment and allow users to submit one to several datasets in rapid succession. Results from the application are still viewed in the application and are just as informative. API access and support is available to subscribers who have opted for API access to either iPathwayGuide or iVariantGuide customers. If you would like to add API access to your existing annual subscription, please contact us at sales@AdvaitaBio.com for additional information. On February 27, 2017, Advaita released a major updates to its platform. These are the release notes. dbSNP (incl 1k genomes) Build 149 Minor Allele freq. NEW FEATURE! Versioning: each report now shows which version of the Advaita Knowledgebase was used to annotate the sample. Outdated reports may be updated when viewing Report Info: either on the Reports page or from within the report itself. As is true for other Advaita applications, only the report owner may update it. Analyses are currently limited to single sample analyses. Multi-sample analyses are in development. Input file size is limited to ~100mb for now. Input files must be .vcf or .vcf.gz version 4.1 or later; reference genomes hg19 (GRCh37) and GRCh38 are supported. Supported filters include by quality, read depth, genomic region, variant class, predicted effect, clinical significance, and impact score. Filter combinations may be saved as “Presets” for later use with new data sets. Detailed variant view includes links to: iBioGuide, dbSNP, OMIM, MedGen, PubMed, and more. View variants in context of impacted pathways. Pathway view highlights affected genes and provides ability to model miRNAs and drugs. View variants in relation to GO terms. Navigate upstream and downstream to identify specific ontology terms. Share reports with individuals or publicly.